This version of A Midsummer Night’s Dream begins in the Peony Garden. Hippolyta and Theseus (Gail McCormick and Chris Harrison) watch on as Egeus (Rich Tolman) tries to force his daughter Hermia (Allison Stock) to marry Demetrius (Sean FitzGerald). 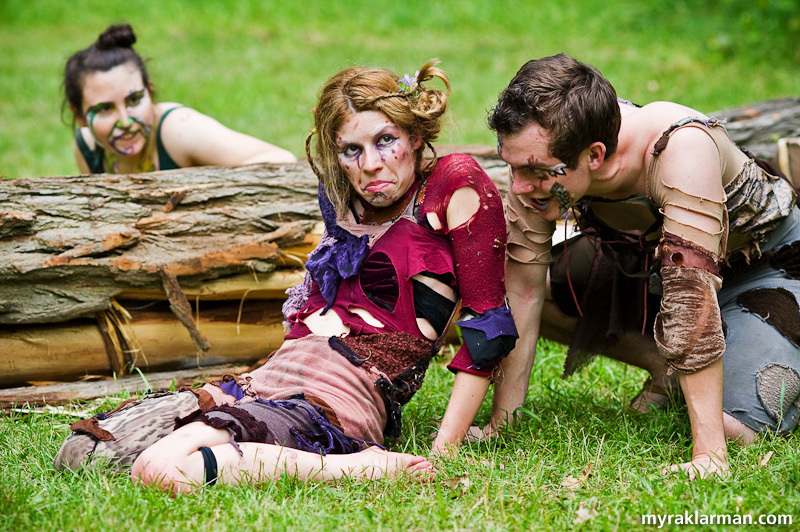 But Hermia wants to marry her beloved Lysander. There was no way I was gonna miss watching my first Shakespeare in the Arb production last week. It’s not that I’m a huge lover of Shakespeare or anything. Quite the opposite: I often shy away from his works. But I really wanted to see some of my favorite performers from the Burns Park Players, including several children, who are in the cast. And I couldn’t let another year go by without the adventure of photographing a theatrical performance in one of my favorite portrait locations. All I can say is, “What a revelation!” If you haven’t yet seen a Shakespeare in the Arb production, now in its 10th year, this would be a great year to start. Save for the mosquitoes (pack repellent), I would characterize the entire experience as glorious. And I say that, even though on the night I attended, the last 5 minutes of the performance were canceled due to a raging downpour. My camera was safe and dry under a rain cover. My body, however, was not so fortunate: by the time I made it to my car, I was drenched down to my skivvies. 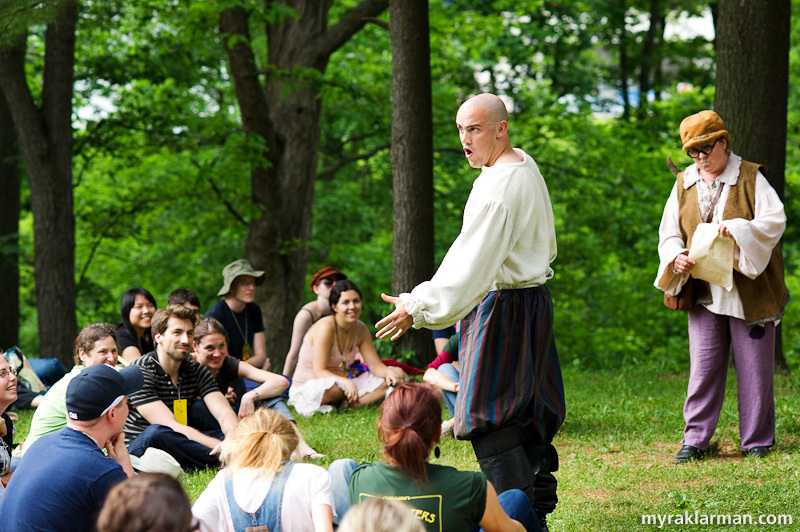 UM Lecturer Kate Mendeloff started Shakespeare in the Arb in 2001, and A Midsummer Night’s Dream was its very first production. Many of the locations and costumes were used in the original production. And several actors are even reprising their roles. I won’t lie and say I understood all of it, but I still thoroughly enjoyed the performances. This production was much more kinetic and visual than the Shakespeare performances I’d seen years ago, and that really helped keep me fully engaged with the action. Here’s a link to Roger Lelievre’s review in AnnArbor.com. For performance times, ticket prices, etc., visit this page. Finally, the Facebook event page shows which actors are performing which roles on which evenings. The audience, seated on chairs and blankets, watches the action. During the performance I attended, umbrellas provided protection from both the sun and rain. 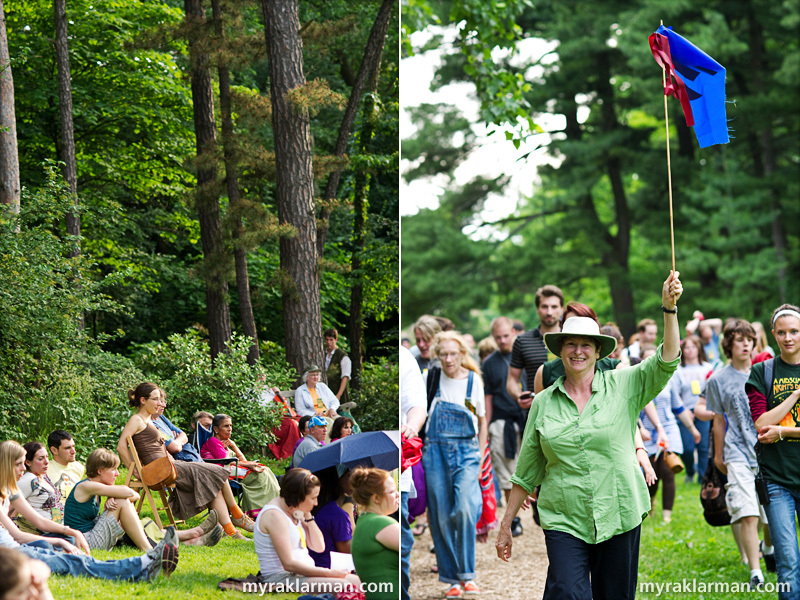 | UM lecturer Kate Mendeloff not only has directed every Shakespeare in the Arb production, but with flag in hand, she also leads the audience to the various locations within the Arb where the action is staged. In some scenes there is hardly a barrier between the actors and the audience. The story features a play within a play — here, the character Bottom (Sam Dodge) constantly interrupts director Peter Quince (Jane Glass) as he attempts to cast the play. 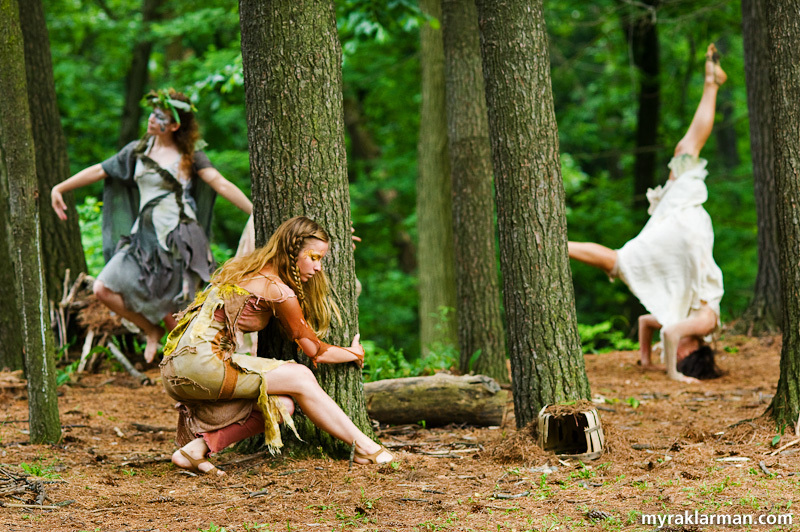 One of my favorite scenes: the fairies frolicking among the pines. 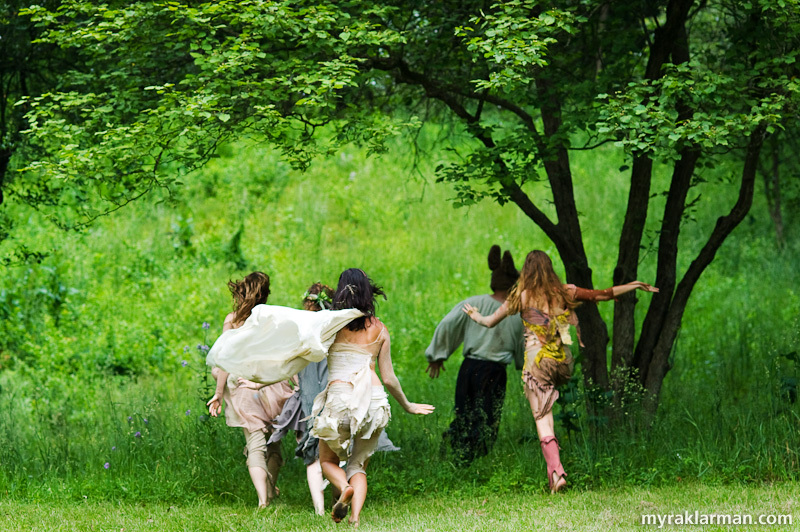 As the audience traveled to a new location, these two fairies would race ahead — leaving period music in their wake. The King and Queen of the Fairies, Oberon and Titania (Graham Atkin and Eva Rosenwald). 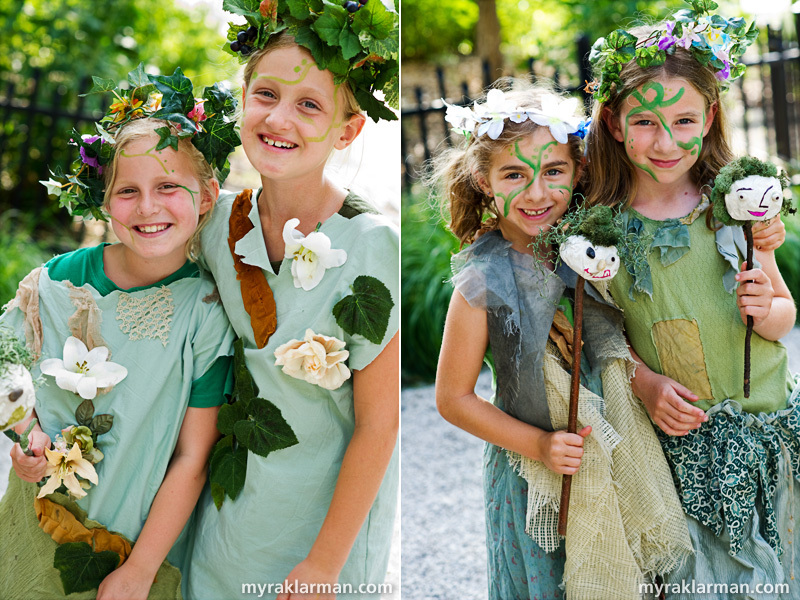 Children and young friends of the cast made cameo appearances as fairies. 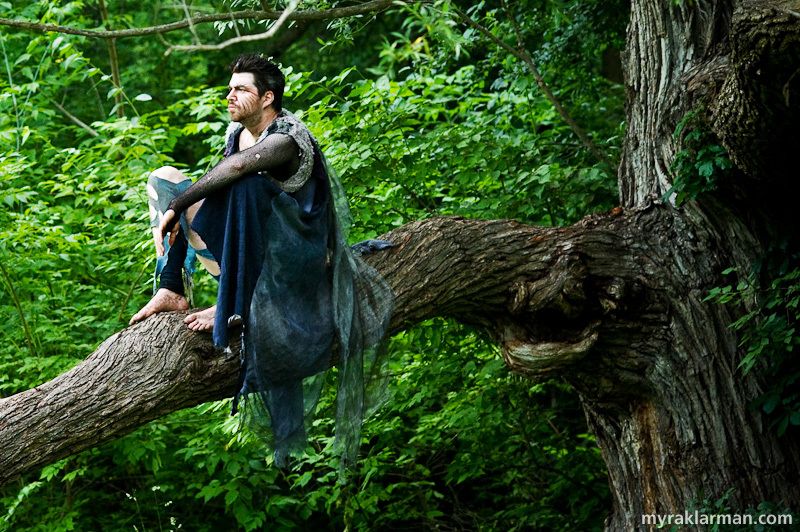 Oberon (Graham Atkin) observes the action from his lushly wooded perch. Atkin also played Oberon in the 2001 production. Sleepy time for Titania (Eva Rosenwald). 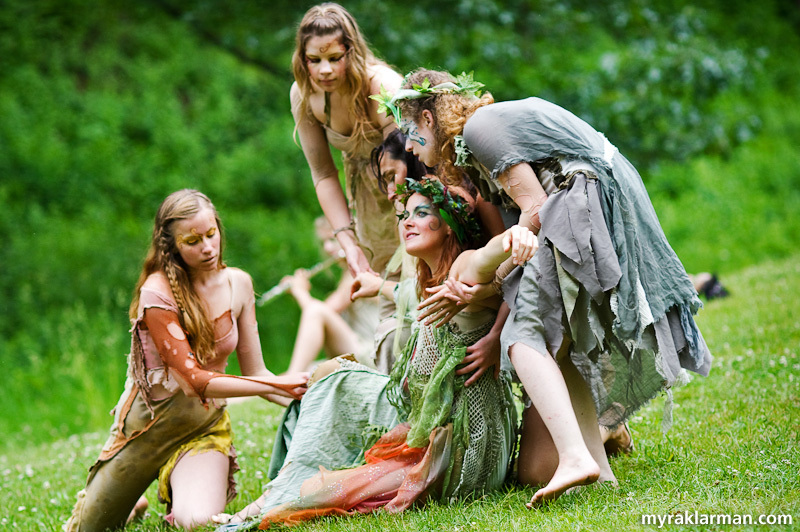 Titania’s attendants included Peaseblossom (Sian Dowis), Cobweb (Megan Mertaugh), Mustardseed (Elise Randall) and Moth (Alison Clinton). The four lovers in a confused — is there any other kind? — love quadrangle caused by magic potions (Chris Anderson, Ellie McIvor, Sean FitzGerald, and Allison Stock). 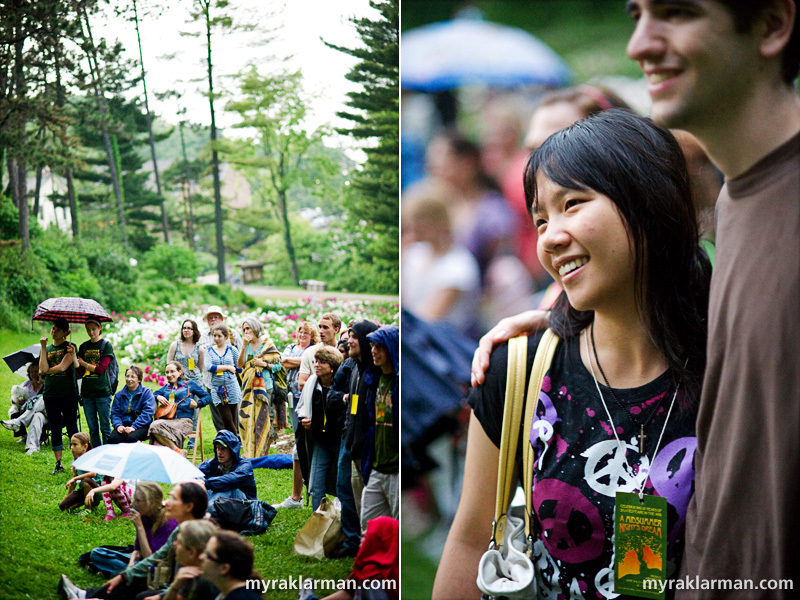 This is moments before the downpour that ended the performance five minutes shy of the end. Fortunately, at this point we were back at the Peony Garden and relatively close to our cars! Wow Myra – you really captured this show beautifully. 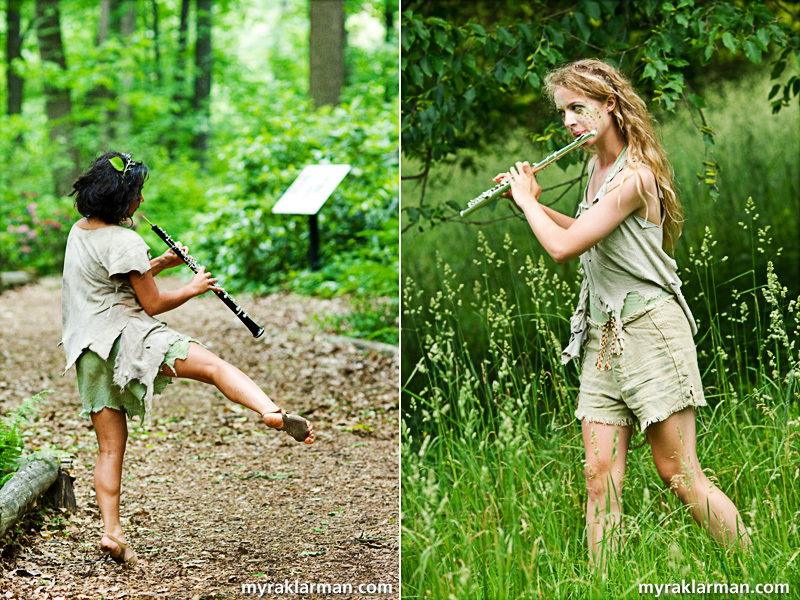 capturing an oboe play en-pointe is masterful. outstanding capture. 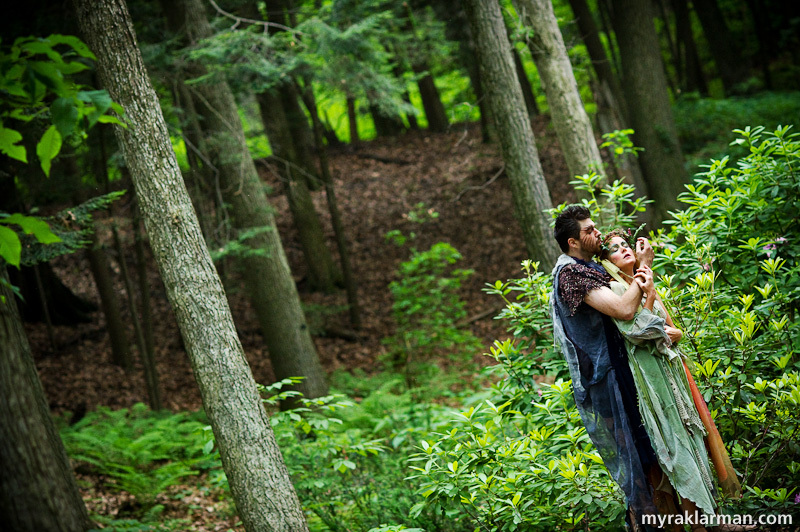 I played Hermia in this production, and think you did an excellent job capturing both the show and the atmosphere of an Arb show, traveling from place to place, the fairies, etc. LOVE these pics.